MassDOT presented Roadways Improvement Projects occurring in Fort Point and the Seaport at FPNA's (Fort Point Neighborhood Association) January 29, 2019 neighborhood gathering. 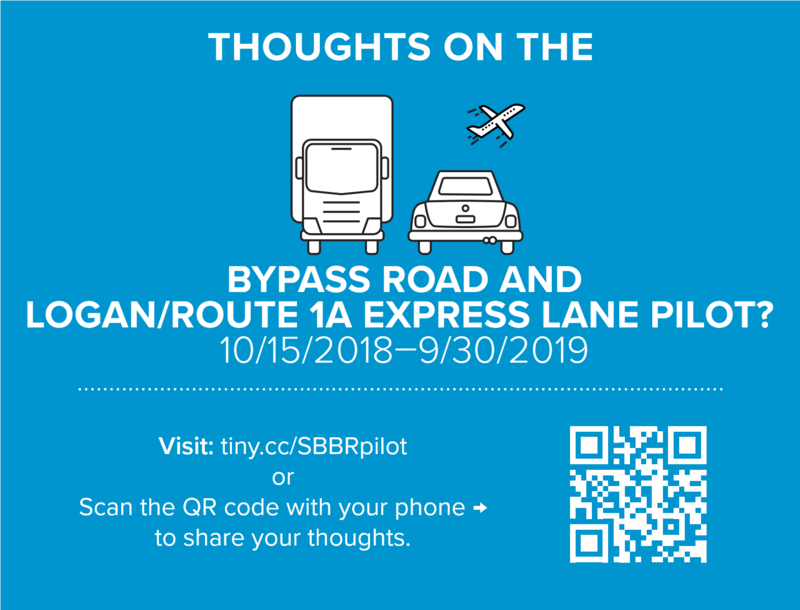 Part of the presentation focused on the South Boston Bypass Road (SBBR) Pilot, which started October 15, 2018 and will conclude September 30, 2019. Will the SBBR be open permanently to non commercial vehicles? Currently, the pilot only allows for a one year opening of the road to all vehicles. Per the MEPA (Massachusetts Environmental Policy Act Office) Advisory Opinion/Approval, the pilot can only be operation for one year and must be competed on September 30, 2019. Beginning October 1, 2019, the road must revert back to commercial vehicle use only. Once the pilot is completed and all vehicle data counts are processed, a report of the findings will be presented to Secretary Pollack. The Secretary will determine if MassDOT will pursue permitting through the MEPA process to ask to have the commercial vehicle only use lifted. Is there any update to report on the pilot? Inbound to South Boston from Frontage Road to Haul Road – increase of 1 minute and 10 seconds of travel time in the AM peak hour (8 am), increase of 39 seconds of travel time in the PM peak hour (5 pm). The increase in traffic volumes is relatively low and is not having a significant impact to the commercial travel along the route. Might the pilot be expanded to bi-directional traffic? Due to the existing congestion on the Hegarty Overpass between the traffic signals at the North and Southbound Frontage Roads and approaching the South Bay interchange, there is no available lane capacity to increase the traffic in this direction. Allowing this movement may create significant queuing along the bypass road and increased travel time to access I-93. 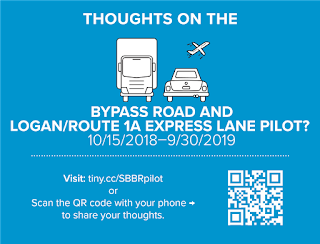 As part of the commitment to MEPA during the pilot program, MassDOT is working to collect feedback on the use of the bypass road by the general public. 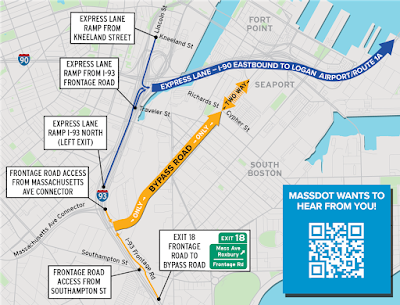 MassDOT is asking the public to reach out and provide any type of feedback on their experience using the roadway. Click here to provide feedback. 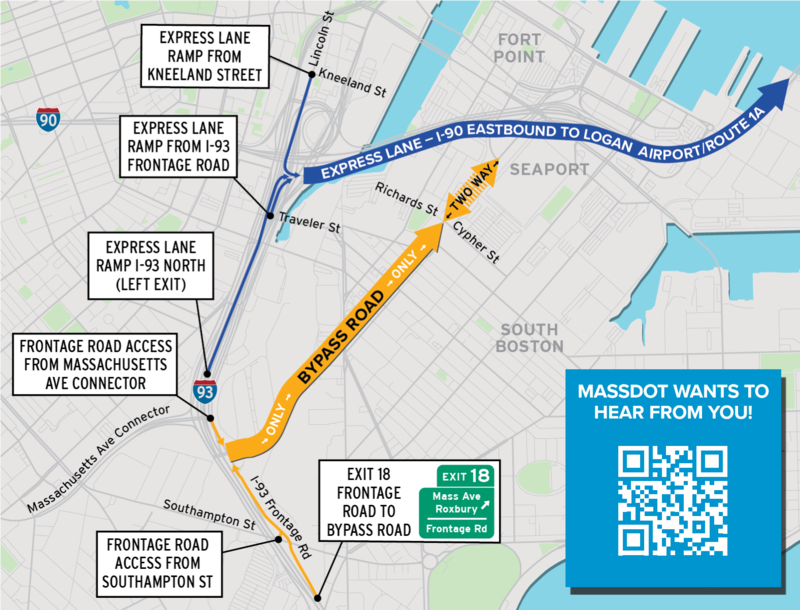 MassDOT and the MEPA office will use all the feedback received as part of the analysis related to the future use of the South Boston Bypass Road.